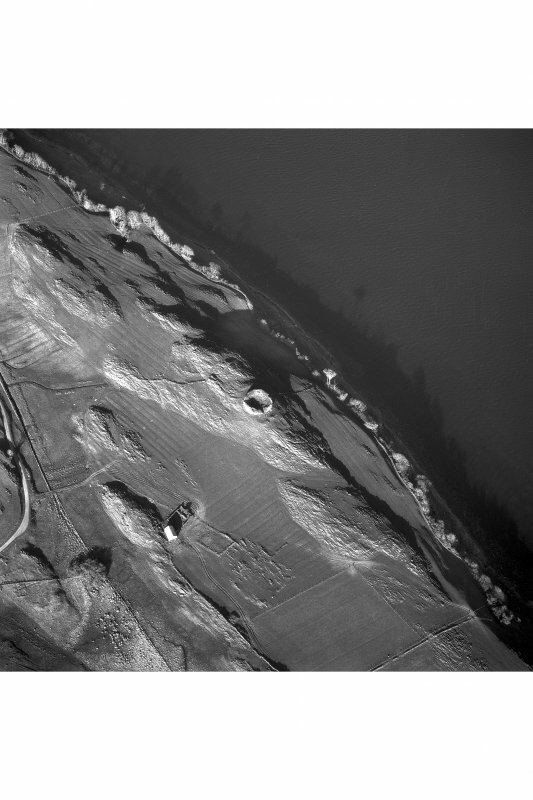 Oblique aerial view centred on the remains of the broch, taken from the E.
View from the NW towards the broch on the skyline. 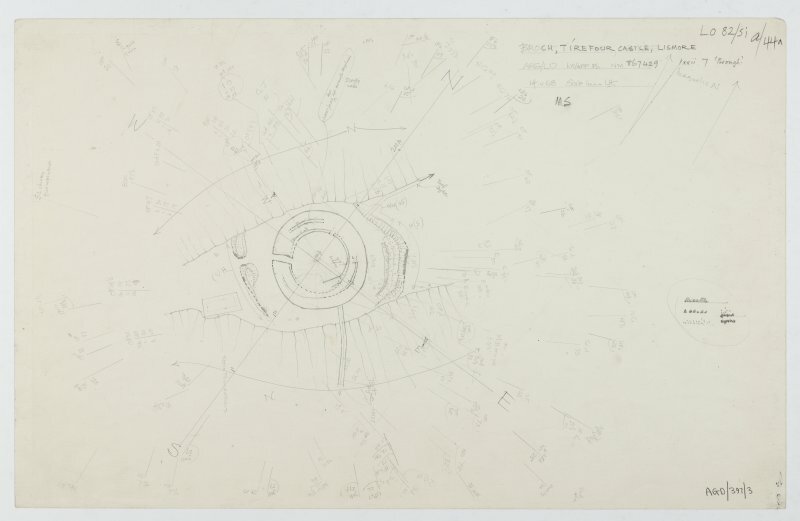 Sketch plan of Tirefour broch. Scanned image from MS 36. Tirefour, interior of NW quadrant. Tirefour from WSW with outwork. Tirefour, interior of SE quadrant. 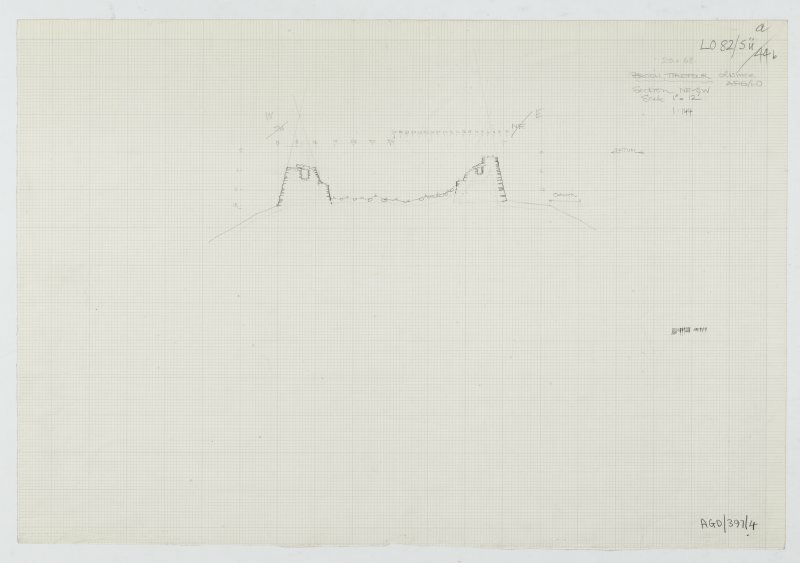 Publication drawing; plan and section, Tirefour broch. 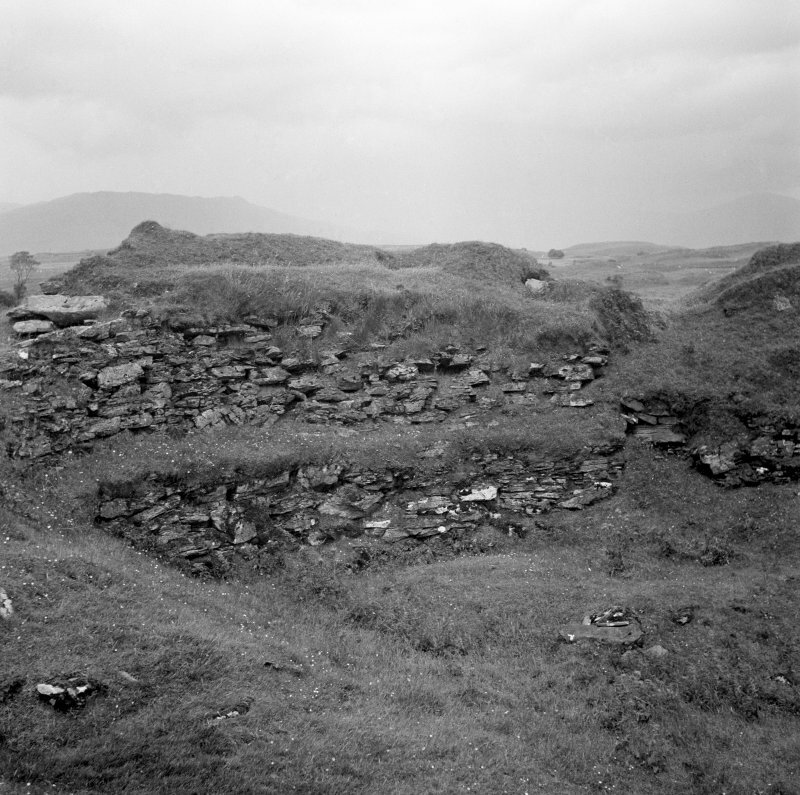 View looking upslope from the SE towards the external wall of the broch. 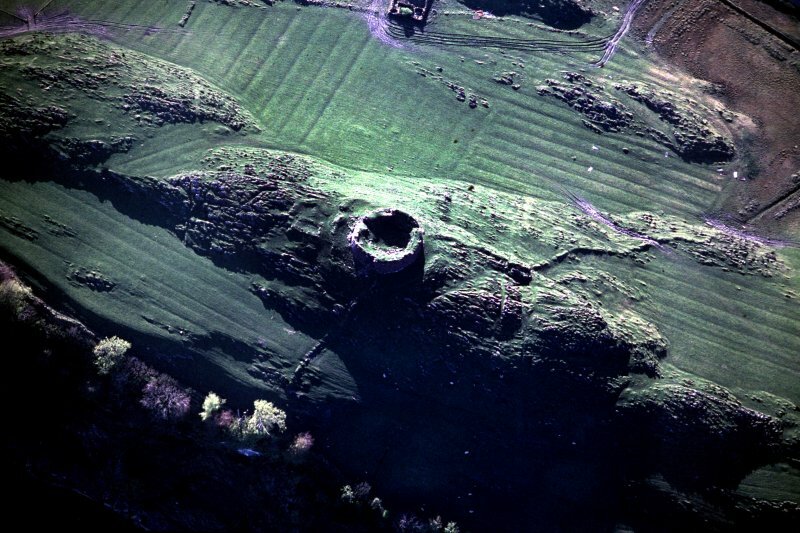 One of the best preserved monuments in the county, this broch stands on the highest point of a rocky ridge and commands an extensive view in all directions. The NW and SE flanks of the ridge fall steeply, the latter to a gently sloping terrace which in turn is bounded by a cliff which rises sheer from the shore. Access to the broch from the NE and SW along the ridge is comparatively easy. In plan the broch is almost circular. At ground level, the solid, dry-stone wall is, on average, 4.5 metres thick and the enclosed court is about 12.2 metres in diameter. The outer face of the wall stands, for the most part, to a height of at least 3 metres and reaches 4.9 metres in the SE. The inner part of the wall however, is less well preserved, the floor of the central court being buried under a mass of debris to a depth of at least 1 metre, although in the NW, the inner face is exposed to a height of 3.5 metres. After rising almost vertically about 2.5 metres above ground level, the inner face is stepped back to form a ledge or scarcement 0.6 metres wide, though this can now be traced for only three quarters of its circuit. Below the ledge, on the north face, there is a doorway 1 metre wide which, although now choked with debris, probably gave access to a mural cell or staircase. 1 metre in height and 0.6 metres in width, whilst a further short stretch, still lintelled, is visible on the east side. The sockets where the outer ends of the lintels have rested can be seen intermittently and some of the dislodged lintels are among the debris on the gallery floor. On the NE side, 0.7 metres above the level of the ledge of the inner face the wall is pierced by an opening 0.9 metres wide which appears to have served as a relieving slit rather than as a doorway. 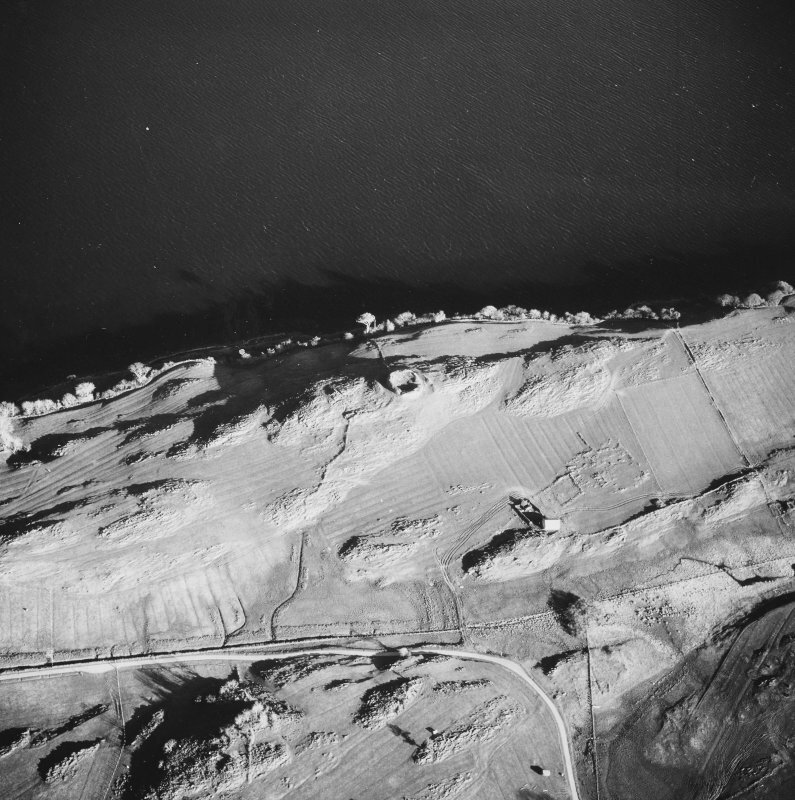 There are protective outworks to the NE and SW, each consisting of a wall running transversely across the ridge. That to the NE survives as a grass-gown stony bank spread to a thickness of up to 5.5 metres and standing to a height of 1.5 metres externally and 0.7 metres internally. It is much reduced at its west end and there is no sign of a doorway. The outwork to the SW is similar, measuring 3 metres in thickness at the base and up to 1.1 metres in external height. There is a well-marked entrance in line with that of the broch. 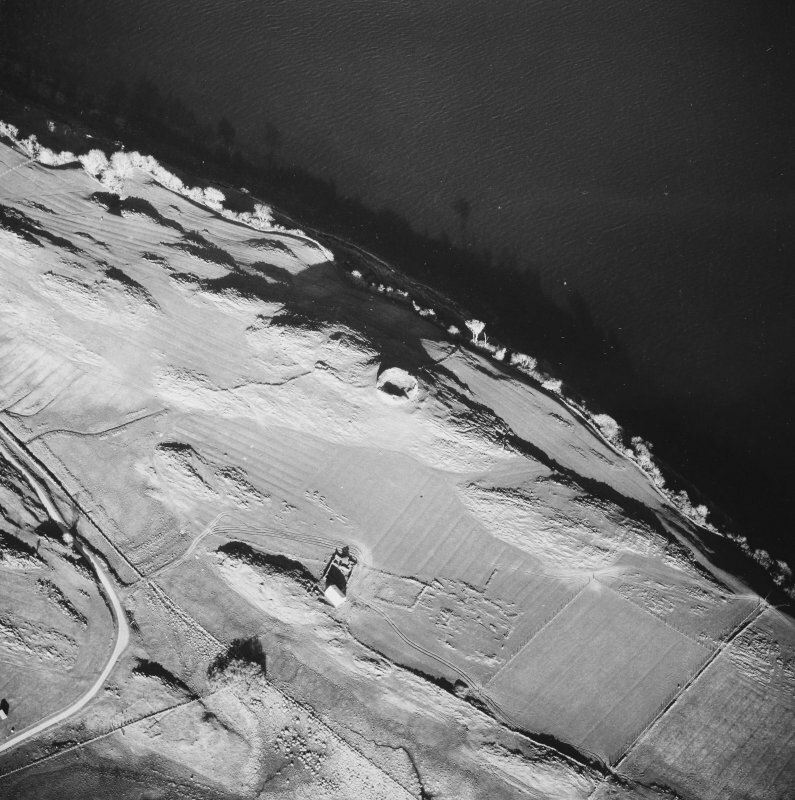 RCAHMS 1975, visited May 1968. 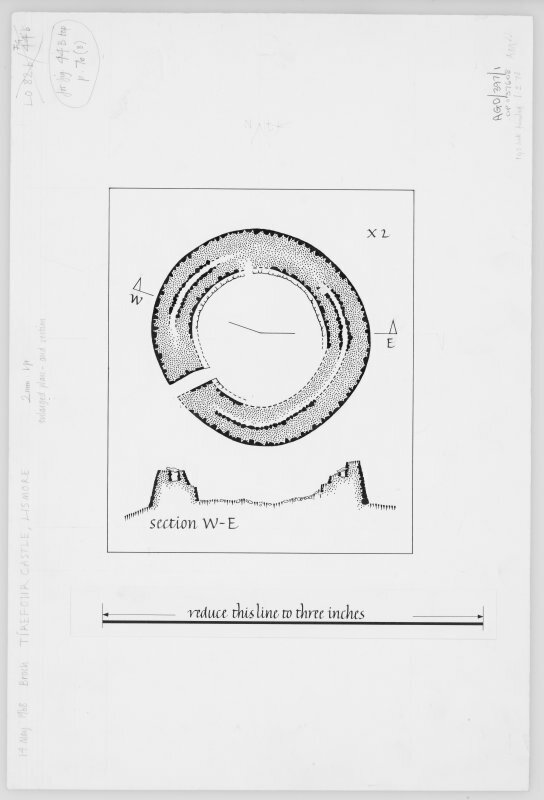 Visited by OS (DWR) 10 November 1971. 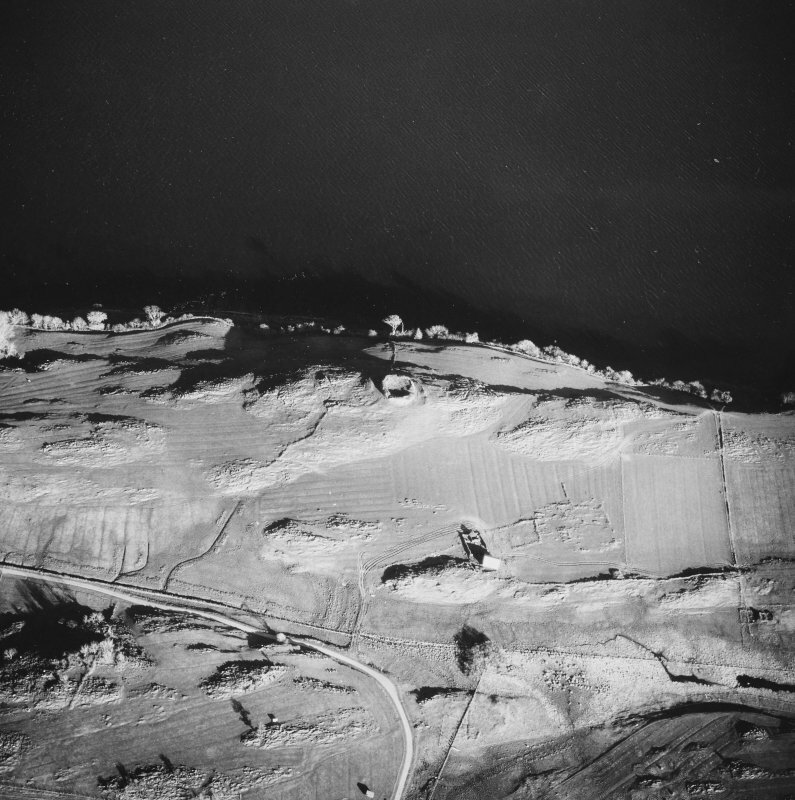 Isle of Lismore - Study and publication phase. Original fieldwork completed in 2005. Some surface survey of the central part of the island in 2007. Consolidation of Tirefour broch planned for February March 2008. Archaeological trail currently being designed by local community. Archive deposited with RCAHMS. Copies currently lodged with Historic Scotland. Funder: Historic Scotland, McDonald Institute Cambridge, CERS (current phase). The magnificent broch of Tirefour stands on the highest part of a ridge on the east coast of the island, a position that offers commanding views of the surrounding seascapes. 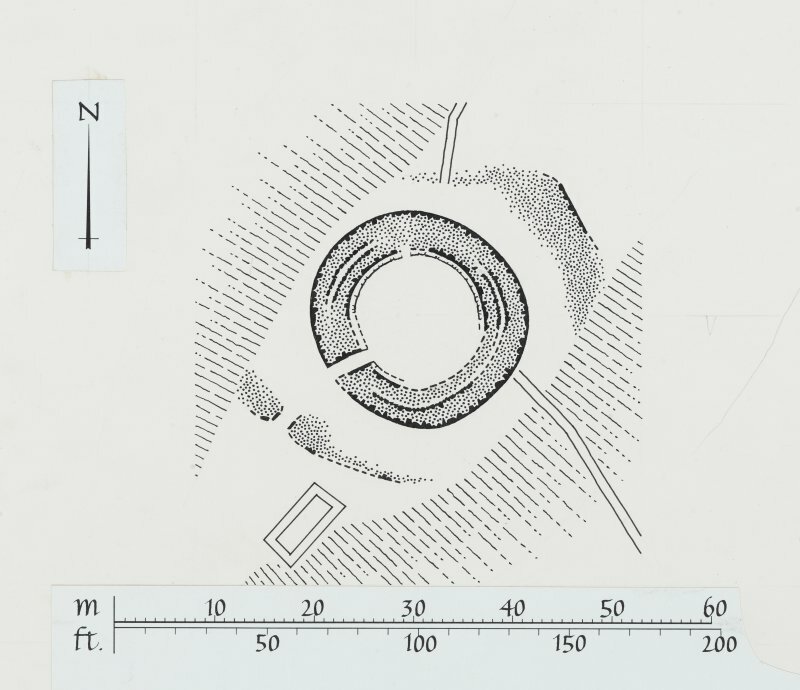 The broch is circular on plan with the central courtyard measuring about 12m within a massive wall about 4.5m thick and still 5m in height. The entrance is on the south-west flank. The wall has been constructed in such a way that the basal part is solid rather than hollow; at a height of about 2.5m there are traces of an internal gallery, and it is likely that the upper part of the broch was of classic hollow-wall construction. At a height of about 2.5m from the original internal floor-level, there is a distinct scarcement or ledge 0.6m wide, which would have allowed internal timber buildings or floors to be keyed into the stone structure of the tower; no excavation has been undertaken and thus we do not know about any internal post-holes which might help to reconstruct such buildings more positively. Look out for the traces of two outer walls, now much denuded, which have provided additional protection for the broch on the north-east and south-west flanks. 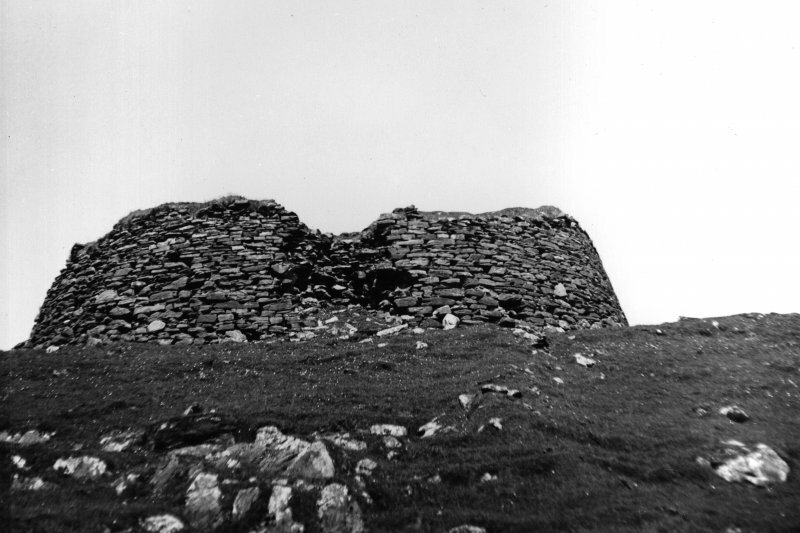 This probably solid-based broch is a conspicuous stump of masonry, visible from afar (it appears on the marine maps as a useful landmark for sailors) and overlooking the sea. It stands on a conical knoll at the north-eastern end of a rising rocky ridge with steep slopes on all sides except the south-west; from this direction the approach to the broch is quite easy. Level 1. The wall may well be a solid one (see ‘Level 2’), with an average thickness of 4.5m (15 ft), and it encloses a Central court about 12.2m in diameter. It has not been surveyed by the author to test its closeness to a true circle. The wall still stands 3.0m high in several places and is 4.9m on the south-east where the batter is marked, having an angle of 1 in 4. The basal courses contain several massive stones. The area around the main entrance is badly dilapidated. The passage faces west-south-west, along the easiest approach, and contains some debris; it is 1.4m wide at each end but, though the door-frame is unclear, it may be at 90cm (3 ft) from the exterior. There are no signs of any guard cells although the sides of the passage are well enough preserved for any doorways in them in the inner two- thirds of its length to be visible. The inner face of the wall is much more dilapidated than the outer, although standing up to 3.5m in the south-west. From about 8-10 o’clock is visible what seems to the author to be a secondary wall built around the interior; it is now visible as a turf-covered ledge about 60cm (2 ft) wide and rising to about 1.5m above the present grassy surface of the court. It may be about 2.5m above the original floor and seems much too wide for a scarcement, although the Commission interprets it as such. At one point there is a break in this wall and what seems to be a built face of ponderous stones – presumably the primary wallface – is visible behind it. However if there is a true scarcement behind there are no signs of it on the exposed wallface. 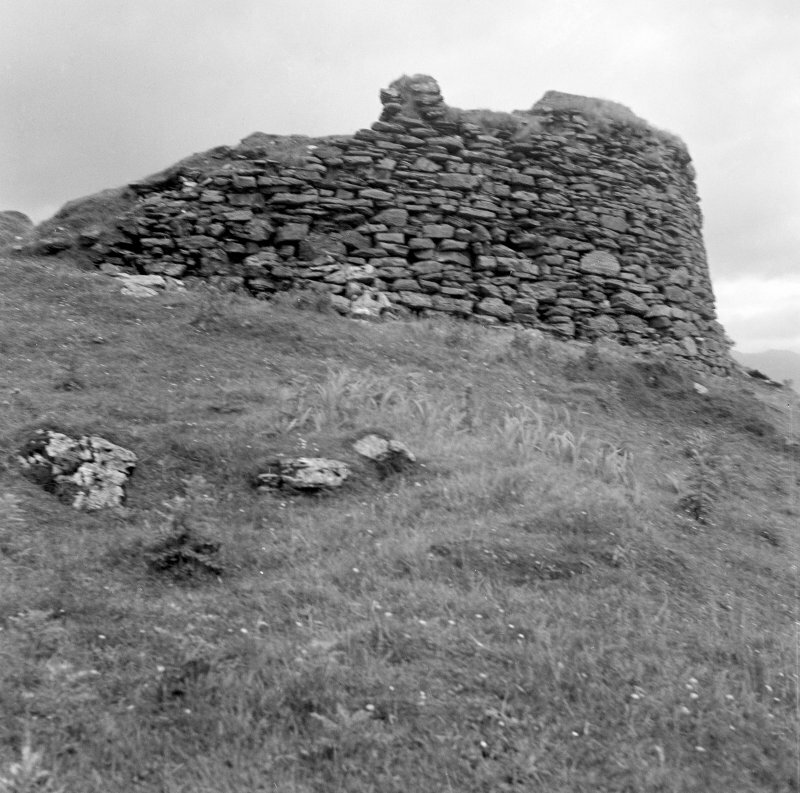 At some stage the broch has been cleared of much of its debris, inside and out; judging from some of the untouched brochs in Sutherland, for example, Tirefuar should be full of stone rubble and its outer wall largely buried by it. Whether the stones were cleared away in some early attempt at exploration or simply to obtain building material is unknown. There are no apparent doorways into the wall at ground level. The thickness of the wall varies from about 4.0 – 4.3 (13-14 ft) on the east to about 4.6 – 5.8m (15-19 ft) on the north and south ; it is uncertain how much should be subtracted from these measurements to allow for the thickness of the secondary wall. The slightly sub-circular shape of the Central court may be caused by these irregularities. Level 2. An upper mural gallery is clearly visible in places on the wallhead, two lengths of it (starting at about 8.30 and 1 o’clock) being still covered with its lintel roof. Looking into the broken end of the former section it is not possible to see the lintels of any gallery below. Neither is it possible to be sure whether the present rubble floor of the gallery – which is fairly level – is original (signifying a solid wall core below) or material which has tumbled in. More investigation would be needed to check this. From 3 - 5 o’clock the outer face of this gallery stands by itself and is exposed to a height of about 1.2m (4 ft). 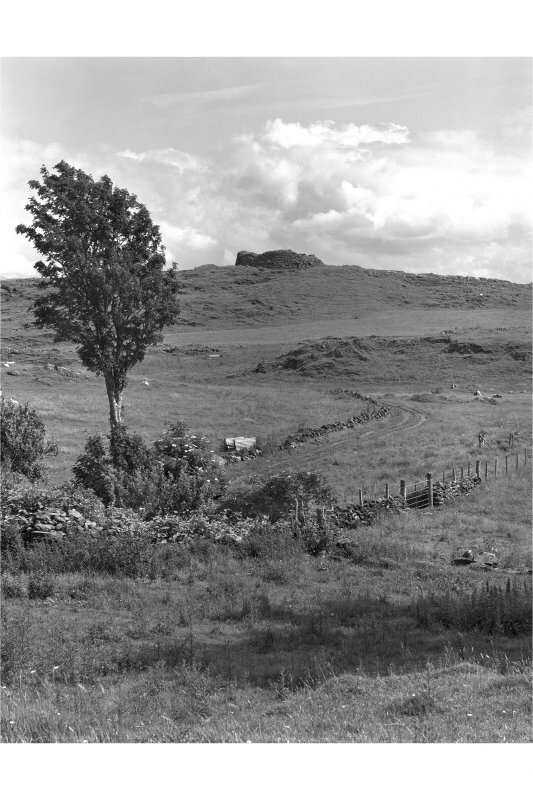 Outer defences: there is a short forework – a boulder-faced rubble wall with a gateway in the middle of it – running across the ridge about 6m south-west of the broch which bars the direct approach to the entrance. Another cross wall is at about the same distance from the broch on the north-east. Without further excavation it is not possible to be sure about some of the structural features visible in this broch. If the “scarcement” is in fact a secondary wall – as the author is inclined to believe – then it probably conceals at least one doorway in the primary wall, that leading to the stair, part of which is presumably still preserved. If it is a primary scarcement then any entry to a stair should be higher up in Level 2. A good example of a late ‘La Tène’ bun-shaped rotary quern is known from the island and is kept at a farm not far from the broch. 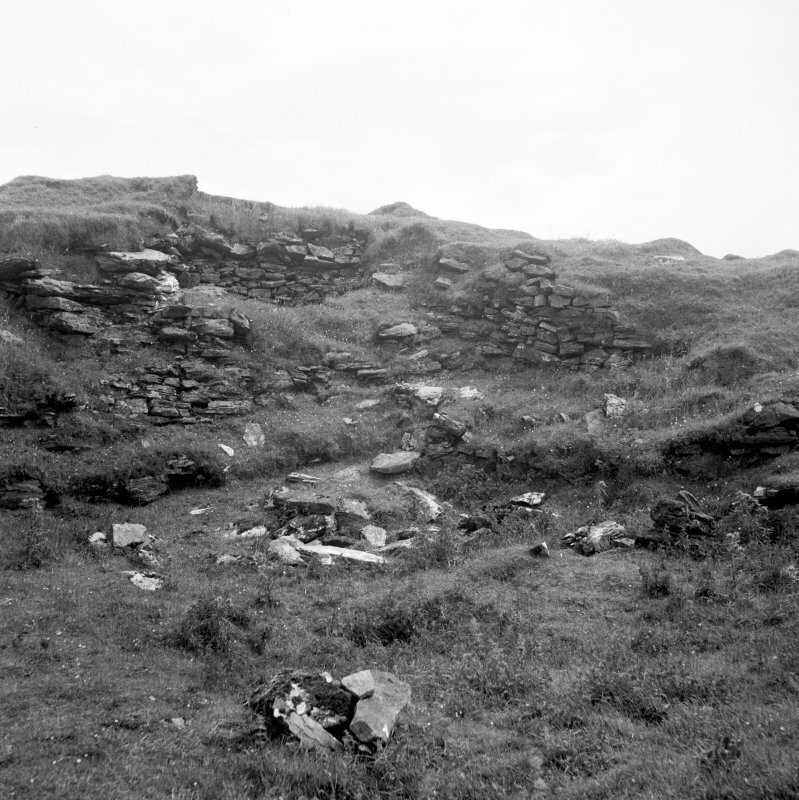 It is possible that this was discovered inside the broch when it was cleared out . 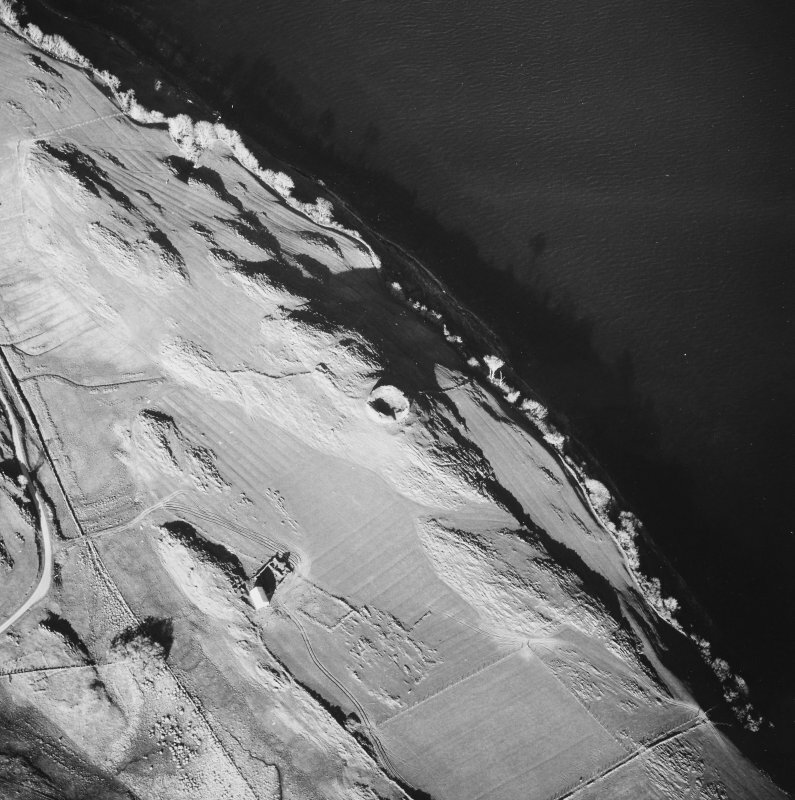 Since 2002 a multi-disciplinary project has been in progress on Lismore  and in 2005 new excavations started at the broch, although so far they have been confined to the outer end of the entrance and to the ground between it and the first outer wall. Some Iron Age material has already been recovered. 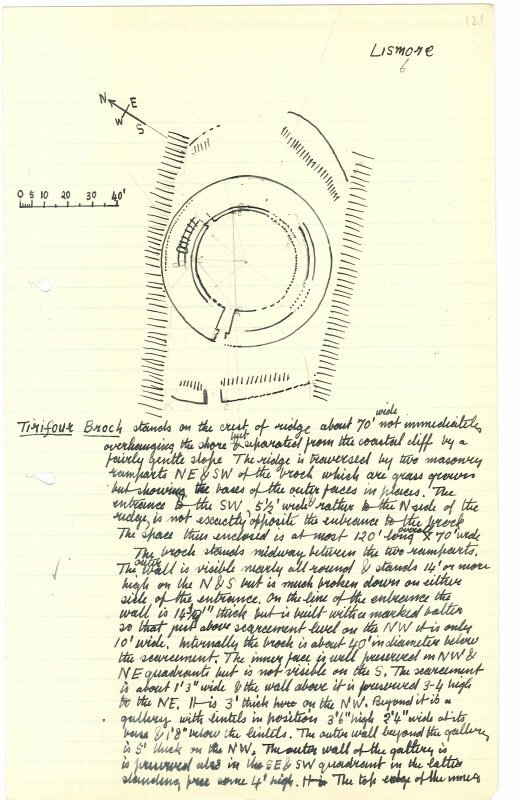 Of some interest too – in view of what was said earlier about the rotary quern – is the discovery of a classic Fintry quern at the site of the near by dun at Park (NM/887459). Sources: 1. NMRS site no. NM 84 SE 1: 2. Christison 1889, 375 and 427 ff. : 3. Young 1962, 190: 4. 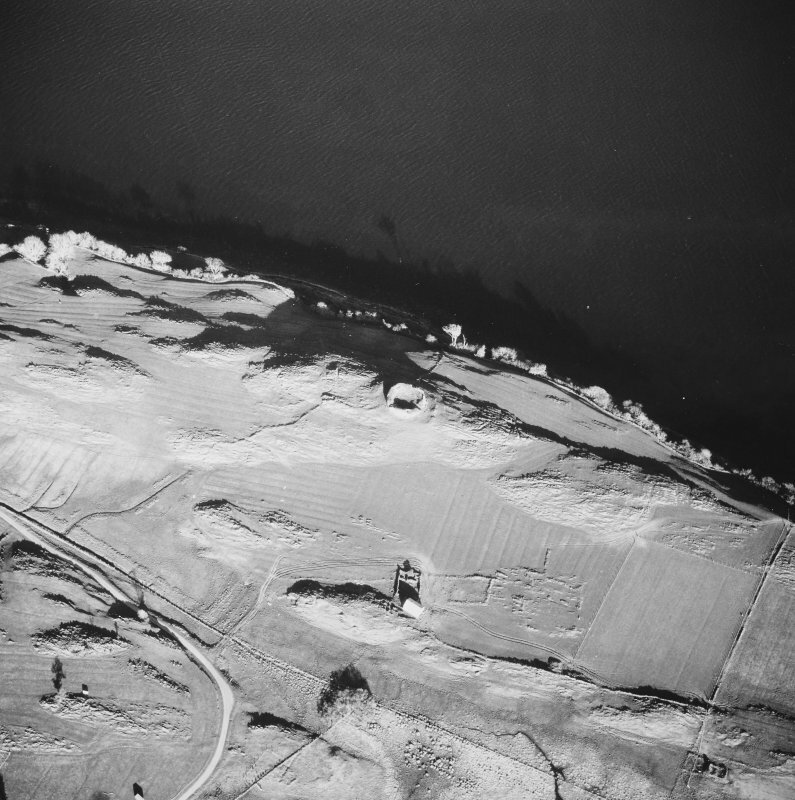 RCAHMS 1975 , 75-6, no. 147, fig. 44 and pl. 10, A-D: 5. Ritchie and Harman 1985, 134: 6. MacKie 2002b: 7. Redhouse et al. 2002. 8. Discovery and Excavation in Scotland 2005. There are more references in . NM 86750 42900 Consolidation work was undertaken, 28 February–29 March 2008, on the broch of Tirefour. The main work was carried out on the seaward side, where a recent deterioration had been recorded at the site of an older major collapse. The work was supported by the landowner (Fell Estate). Archive: RCAHMS (intended). Report: Historic Scotland and Forward Scotland.